Control Solutions’ Model VP4-2330 ValuPoint® Programmable I/O for BACnet MS/TP is a BACnet Application Specific Controller (B-ASC) with 23 I/O points and programmable control. The ValuPoint® platform features 14 universal context sensitive inputs. When configured as an analog input, the continuously self-calibrating sigma-delta converter produces 15-bit resolution with high noise immunity. When configured as a discrete input, the converter switches to 10-bit resolution at 1,000 samples per second for fast response. ValuPoint VP4-2310 also includes 3 analog outputs, 6 Form A relay outputs, and pulse counting capability on all inputs. The VP4-2330 is designed to be a building block in a distributed control system where controllers communicate peer to peer via BACnet MS/TP. Each ValuPoint controller can access BACnet objects in other BACnet devices, both ValuPoint controllers and other manufacturer’s devices. Remote objects are mapped to local objects that mirror the value of the remote object. Control Solutions’ Model VP4-2330 ValuPoint® Programmable I/O for BACnet MS/TP is a BACnet Application Specific Controller (B-ASC) that includes programmable control. The 4th generation ValuPoint® platform is designed to be a building block in a distributed control system where controllers communicate peer to peer via BACnet MS/TP. The ValuPoint® Model VP4-2330 features 14 universal context sensitive inputs. When configured as an analog input, the continuously self-calibrating sigma-delta converter produces 15-bit resolution with high noise immunity. When configured as a discrete input, the converter switches to 10-bit resolution at 1,000 samples per second for fast response. Analog Input objects provide data from the analog I/O points. Linearization tables are provided for 10K and 20K type II, III, and IV thermistors. Input type and scaling is configured by writing to object properties. Analog and Binary Output objects provide BACnet access to the outputs. Pulse input at up to 1kHz is available on 2 channels in all modes. If analog inputs are sampled in fast 10-bit mode, pulse input to 10Hz is available on all channels. Pulse counts are totalizing, and saved to non-volatile memory every 15 minutes. 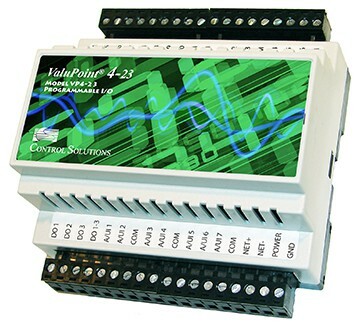 ValuPoint Model VP4-2330 also includes 3 analog 4-20mA outputs, and 6 Form A relay outputs. All I/O points are accessed as BACnet objects. The user has the ability to assign object allocation as part of setup of the controller. Resources are allocated from a common pool, and the user has the ability to decrease the number of one type of object in order to increase the number of another type. Total object count will range from approximately 100 commandable objects (with full priority array) to 200 read/write objects. Object types include analog, binary, and multi-state variations of input, commandable output, and writeable value. 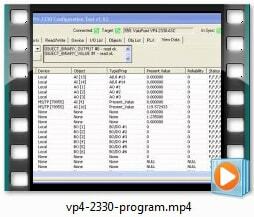 ValuPoint® support software, available for download at no cost, includes the VP4-2330 configuration tool, i.CanDrawIt graphical programming tool, and the pliWrite line programming tool. Both programming tools support both simulated execution and live debug. The tools connect via a BACnet IP to MS/TP router, or via Control Solutions’ MTX002 USB to MS/TP adapter. The VP4-2330 configuration tool connects to the MS/TP network using the MTX002 MS/TP to USB adapter (if not using a BACnet IP router). This intelligent adapter plugs into your PC's USB port, and offloads the MS/TP token passing from the PC to make it more reliable. The MTX002 allows you to connect your PC to an MS/TP network running at 76800 baud, something not possible with a generic RS-485 port adapter. The MTX002 functions as an MS/TP device itself. The combination of the MTX002 and configuration tool running on your PC will appear on the network as a discoverable BACnet device. The diagnostic pages in the configuration tool can be used to read and write any objects in any MS/TP device on the network. The configuration pages provide templates for reading and writing the multiple properties per BACnet object that define its configuration or client/server mapping. All configuration parameters exist as properties of BACnet objects which are accessible to any BACnet client. The Control Solutions configuration tool simpy provides a user friendly template for accessing those properties. 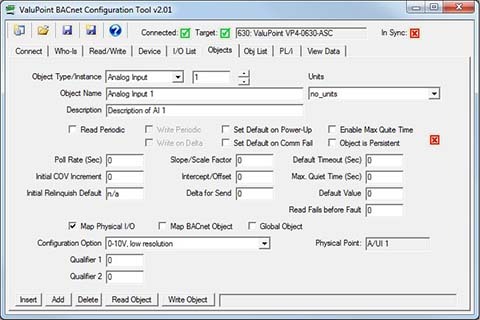 The ValuPoint VP4-2330 Configuration Tool is a user friendly configuration tool that provides simple templates for assigning the BACnet object properties that configure the device. Connect the ValuPoint to your laptop via a USB to MS/TP adapter (MTX002) or via a BACnet IP router. i.CanDrawIt® is included at no additional cost with every ValuPoint® controller from Control Solutions. 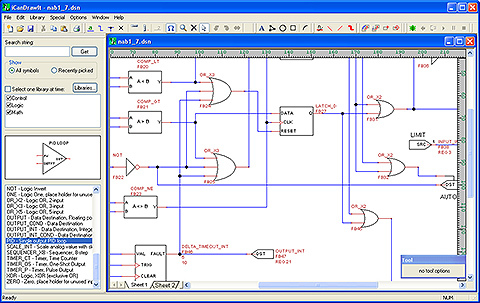 i.CanDrawIt® works just like an electrical schematic CAD program, except you draw control programs that look like circuits. The resulting software will function like the circuit you draw. i.CanDrawIt® includes visual program simulation as well as visual live debugging where supported by the target device. Set breakpoints or step through the program one visual function block at a time. Update variables and I/O objects in simulation or live. • 500 ohm load max. 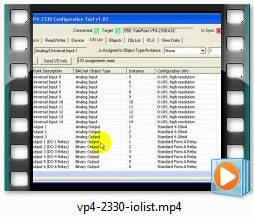 Watch these videos for an introduction to configuring the ValuPoint. It's easier than reading!